Green Hill Press is available to anyone who simply needs their work printed (or reprinted). While we are expert book designers, our studio can design and arrange print for everything from corporate identities, business cards, annual reports through to a pop-up banner! If your artwork is already done check out our great print options and print products. The decision about how to print a book nowadays is simply determined by the quantity needed (not quality). The diagram below shows that self-publishers who know what volume they need to print can choose between the two methods – if the volume is less than the “critical point” then print digitally. If the volume is higher, then the self-publishing project warrants offset printing. At Green Hill we can advise you on which print method to use. And we have an array of printers (both offset and digital) including those based in Sydney, Melbourne, Adelaide, Taiwan and China. Offset printing uses ink and printing plates to transfer an image onto paper. This print process requires manual labour and takes longer to set up. Because of the costs involved in setting up, it is only cost-effective for long print runs. Digital printing uses new-breed machines much like photocopiers but ones that achieve outstanding quality. The difference between digital printing and offset printing can sometimes really only be spotted by a highly trained eye. Print on demand means you might only print the book when you receive an order. If one person places an order for your book through a service like Amazon, Green Hill’s printer can print a single book, post it and receive payment on your behalf. 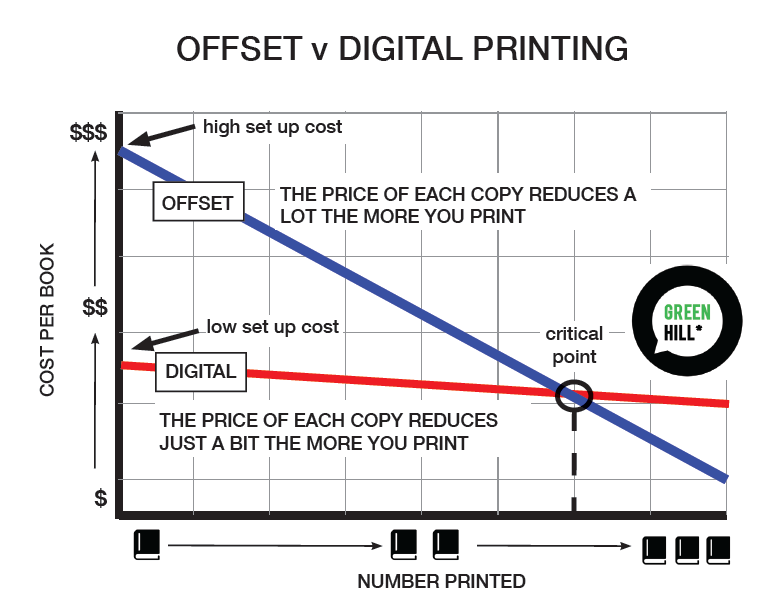 This is possible because the price to print a single book digitally is much lower than the price to print a single book using offset printing. Print on demand is a huge opportunity for self-published authors!